Diesel prices were on Saturday hiked by 50 paise per litre but there will be no revision in rates of petrol this fortnight. The price increase, the 11th since January, excludes local sales tax or VAT and will be effective from Saturday midnight, oil companies announced. The price of diesel in Delhi will be hiked by 57 paise, including tax, to Rs. 53.67 per litre, while it will cost Rs. 60.70 a litre in Mumbai as against 60.08 currently. There will be no change in petrol prices as oil companies decided not to pass on the 25-30 paise increase necessitated by depreciation of the rupee against the US dollar. State-owned oil firms, which revise petrol prices on the 1st and 16th of every month based on trends in oil prices and currency exchange rate in the preceding fortnight, had left the rates unchanged even on November 16. Petrol prices were last revised on November 1, when it was cut by Rs. 1.15 a litre. It costs Rs. 71.02 a litre in Delhi currently. The government allowed oil companies in January to raise diesel prices in small doses every month to wipe out mounting losses. While most of the shortfall on diesel sales should have been wiped out, losses mounted to Rs 14.50 per litre in July-August as the rupee fell about 25 per cent from April levels. The recent firming up of the rupee against the dollar and the monthly price increases has trimmed these losses to Rs 9.99 a litre. Diesel rates have risen by a cumulative Rs. 6.62 this year. Accordingly, since then, retail diesel prices are being revised every month. “Even after the current increase, under recovery (loss) on diesel shall stand at Rs 9.99 per litre,” state-owned IOC said in a statement. 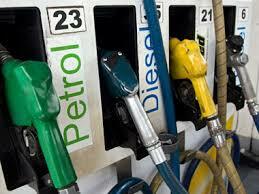 The loss on diesel widened from Rs 9.58 at the beginning of November due to depreciation of the rupee. Besides diesel, oil firms lose Rs 36.20 per litre on kerosene sold through the public distribution system and Rs 542.50 per 14.2-kg cylinder of domestic cooking gas (LPG). The losses on kerosene and LPG have widened from Rs 35.77 per litre and Rs 482.50 per cylinder, respectively, at the beginning of the month. “For the year 2013-14, the Corporation is expected to incur under-recovery of around Rs 72,000 crore on sale of three sensitive products,” the IOC statement said. The combined loss for IOC, Bharat Petroleum Corp and Hindustan Petroleum Corp is estimated at about Rs 1,39,000 crore.